Heat oven to 350°F. Line large cookie sheet and 15x10x1-inch pan with parchment paper. Separate dough into 8 biscuits. Place green onions in pie plate or dish. 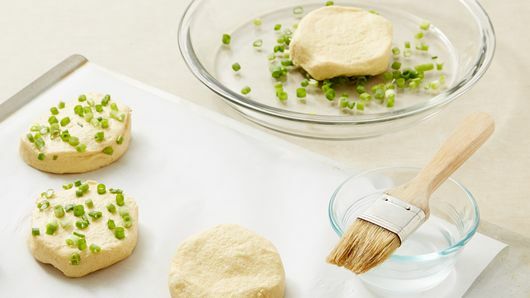 Brush top of each biscuit with water; press tops into green onions. Place 2 inches apart on large cookie sheet, onion sides up. Bake 14 to 17 minutes or until golden brown. Remove from cookie sheet to cooling rack. Increase oven temperature to 400°F. Meanwhile, in small bowl, mix mayonnaise, garlic powder and 1/4 teaspoon pepper until well blended; refrigerate. Cut each turkey tenderloin in half crosswise to make 8 tenderloin steaks. Wrap 2 slices of bacon in crisscross pattern around each steak. Place 2 inches apart on 15x10x1-inch pan. 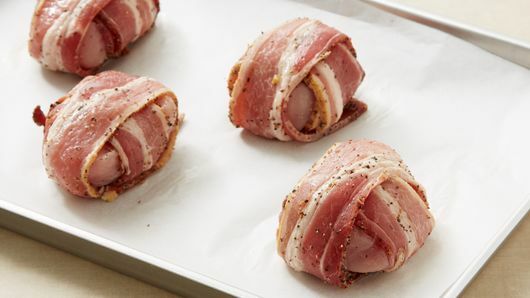 Bake 28 to 30 minutes or until juice of turkey is clear when center of thickest part is cut (165°F) and bacon is cooked. Set oven control to broil. Split biscuits. Place biscuit halves, split sides up, back on large cookie sheet. Sprinkle split side of each of the 8 biscuit tops with 1/4 cup cheese. 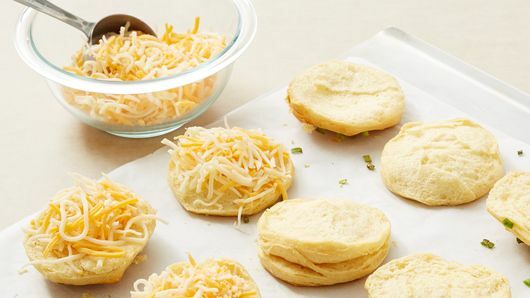 Broil with tops 4 inches from heat 1 to 2 minutes or until biscuits are toasted and cheese is melted. 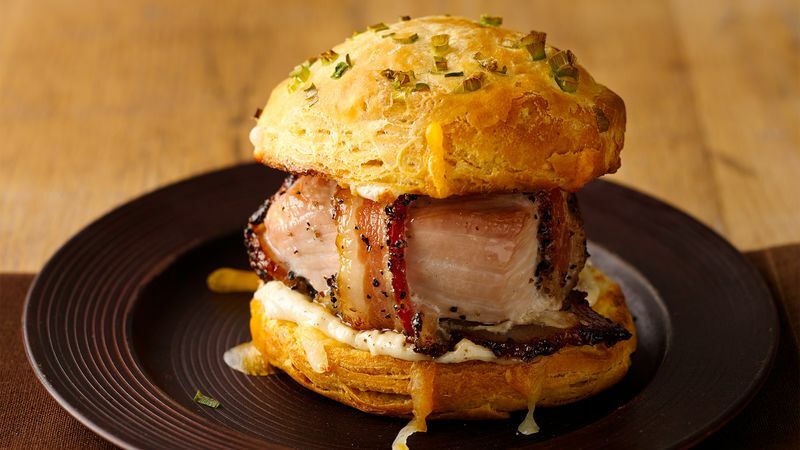 Spread garlic-pepper mayonnaise on split side of each of the biscuit bottoms; top with turkey steak and biscuit top.